And then I saw the shawl that Molly of A Homespun House finished and something clicked. Suddenly it seemed an opportunity to learn, a chance to push myself, a reason to throw myself headlong into the color obsession that seems to be eating at me. I’m so in love with it I could barely wait to wind up the skeins before starting. I made myself wind everything up, though, knowing that it would be most fun to be able to just grab and go as I knit. I am nearly halfway through the first clue and enjoying every row. I was skeptical of the whole marl concept, but it’s a thrill to see how different yarns change the feel of this steady pink. Hedgehog Fibres in l-r Monet (2), Boombox, and Teacup. Malabrigo Rios in Pearl, and Rowan Kidsilk Haze. In other news, I’ve swatched for my very first sweater. I was inspired by Amy over at Crazy Mom Quilts to knit the Harvest cardigan. I have a sweater quantity of Knit Picks Preciosa that was meant for a pullover, but this cardigan is calling my name. My swatch is too big though, so I need to go down a needle size and swatch again. All of this and the first pattern of the shawl society will be released on Thursday. I had better get knitting! Today is a tale of two FO’s. One revived old project and one very new project. First up, I finished the first of my revival socks! These knit up beautifully, and I really love the way the gauge changed the pooling on the sock. This pair has been a bright knit on some particularly rainy April days. These are my sixth pair in my box o’ sox. When I started these back in May-ish of last year, I knit toe up socks and split the ball of yarn in half. When I decided to revive these, I was presented with a problem. One skinny sock, one 50g ball, and one 19g ball was the yarn that I had. I didn’t really feel like ripping back the sock and washing the yarn at the moment, plus I wanted to have it to compare the new socks with. So I knit the first sock with the larger ball of yarn and combined the two smaller balls to make the second sock. In the end, I added the new ball of yarn to the top of the of the foot somewhere in the gusset and you can’t really tell. I wound up with about 9g of unknit yarn at the end. Not bad for three socks! My second FO wasn’t even a WIP the last time I posted. I cast it on on a Monday evening and bound off the following Sunday afternoon. That’s what I call a quick shawl. 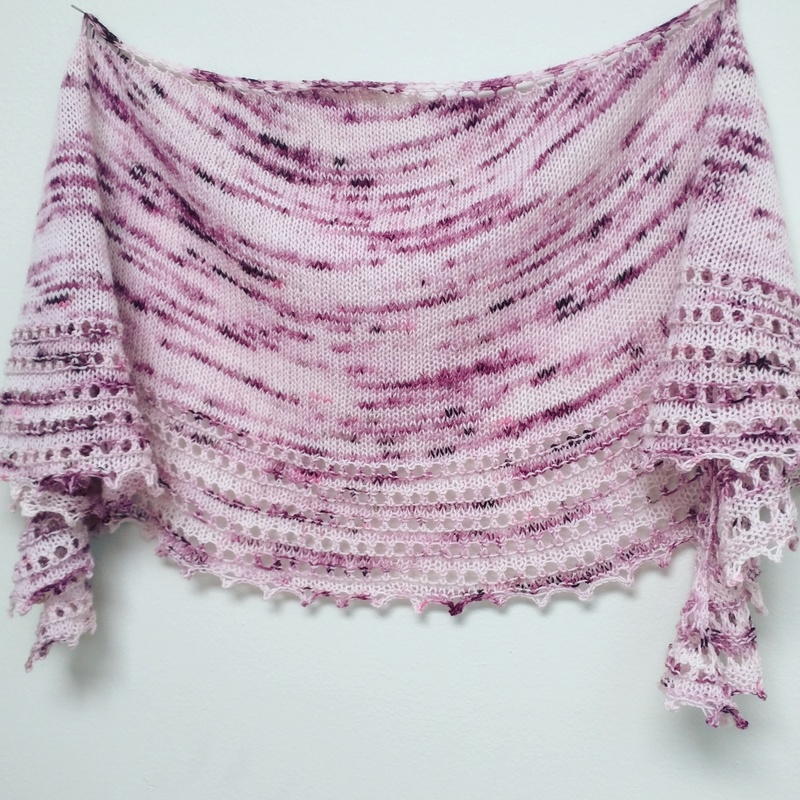 The pattern is the Spindrift Shawl, and it’s a free pattern if you sign up for Helen Stewart’s shawl workshop. One of the things I love about Helen’s patterns is her percentage system. It’s a little like striped socks, it’s so easy to think just one more, one more 5% chunk, then I’ll go to bed. One word. Addictive. This is a one skein shawl and I used 90g of my skein. I was a little skeptical about the size, tending to like larger shawls. But it blocked out to the cutest little light, airy shawlette. Plenty to drape over my shoulders on a summer night or wear as a spring shawl draped around my neck. The yarn is YarnInk and was a club colorway from February 2016. I love how it is so soft and speckly and sweet. I have plans for my next shawl and next pair of socks already. I’ve picked out my yarn for the first shawl society shawl, due out in May. The peach and mint is a bit out of my usual comfort zone, but I’m digging it. I think I’m going to try to go for a revival sock pair every other pair, so that I can mix in some fun new socks as I go. I got some new yarn in from Baerenwolle, and it seems to be just the ticket for spring. Joshua also has a sock request in the queue and his birthday is coming up. It seems my knitting cup runneth over! YoM days 101-106: Shawl knitting and finished Spindrift! 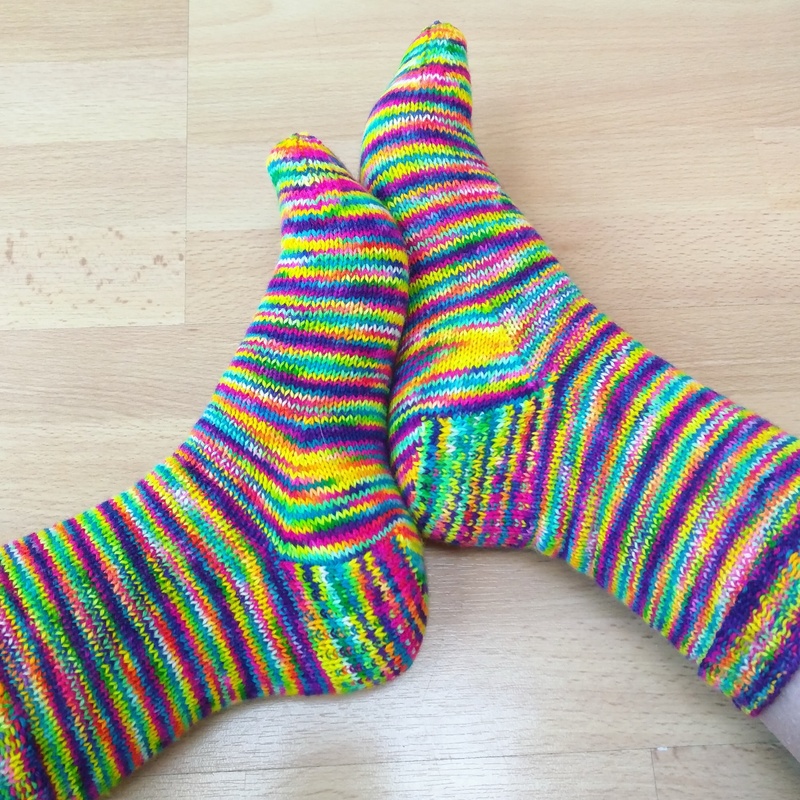 YoM days 107-110: Sock knitting and finished pair 6 of the year! Yesterday, I got up pretty early for a Saturday to see Kevin and Astra off for a trip. Joshua and I stayed home and had a fantastic evening with my brother’s girlfriend, who was stopping through on her way north. We took a long walk, made supper, and stayed up late—for us—knitting and talking. Before our lovely evening Joshua and I ran a few errands, one of which was a very important trip to my LQS. I’ve had it in my head for a while to make myself some spring bags, but mostly was looking to replenish my stock of solid white yardage. They were out of the solid white, but I did find some fun prints to stoke my creativity. I picked a solid to go with each and got out of the shop before any serious damage was done. In knitting news, my revival socks are coming along really nicely. I’m falling in love with the yarn all over again, and can’t believe how different the new sock (top) looks from the old sock (bottom). I’ve also signed up for the second season of Helen Stewart’s Shawl Society. I didn’t participate last year, but I enjoyed the Snowmelt so very much that I decided to take the plunge this time around. The Shawl Society is a six-month club, with one shawl pattern released each month. I’m challenging myself to knit all six, let’s hope my steam holds out through September! Yarn hints for the first shawl come out tomorrow and I can’t wait to go stash diving. Finally, tomorrow marks my first 100 days of making! I’m going to do a bit of recap and I’m looking forward to taking a moment to reflect on this project. YoM day 95-98: Sock knitting! Thank you to Joshua for the photography! Much like winter in Maryland, the shawl is finished. My very first mystery knitalong and my biggest project to date. All done. I couldn’t be happier. The pattern, Snowmelt Shawl by Helen Stewart, is just divine. So easy to follow and well written. I loved knitting it, even when it got to be in the 500+ stitch range. The yarn is all by Peepaloo Fields, and boy am I huge fan of hers now! The soft but fun colors of these yarns really tug at my heartstrings. I’ve been joking about how even my subtle colors turn out loud, but I think the overall effect is soft and sweet. Up close it’s a symphony of mint and pink and lilac and yellow. These yarns are all the 80/20 base, Sensible Sock in (A) Smitten, (B) Bumble, and (C) Smokestack. It really bothers me that that one point is turned under, but the light’s gone now. It took me a little less than two months of not being overly faithful to this project to finish it. I’ve been a little listless without a big project on the go, but luckily I have two quilts that are begging to be cut and pieced. I hope you are enjoying the season and any sunshine that you may be having. For me, this snowmelt shawl and the sunshine we’re having fit very well together to brighten my day. These were all declared dead due to fit issues, most of them being too small. I had a weird period last summer of ill-begotten socks with major gauge issues. It was as if I was strangling the life right out of the yarn. I managed to fix that problem—still not sure how, beyond just relaxing—and my socks have fit just fine since. The unfinished socks have not rested easy, however. Since all of these sock projects are around a year or more old, they kinda feel new. Bam! Two birds with one needle, er, stone. My plan is to knit a pair of these each month through Sepetember. I’m going to start with the KnittyandColor pair. That—completely finished—sock is so small. So skinny that I can’t get it all the way on my foot, let alone up over my ankle. Oh well. I think there’s enough in the cakes to knit a whole pair so I’m going to try that. Then I’ll unravel the sock and wash the yarn for minis. I’m excited to turn all of these zombies into alive and happy socks. I remember purchasing all of the yarn and it all still makes me happy to see, so I can’t wait to add them to my box o’ sox! YoM day 91: Snowmelt shawl, started a new quilt top, and finished sock pair 5! YoM day 92: Sock knitting and finished Snowmelt Shawl! !